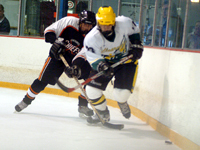 Facing elimination and an end to their season, Clearview rallied from a 3-0 first period deficit and defeated Rancocas Valley 4-3 at the Skate Zone in Voorhees. Goals by Kevin Lion, Shane Veight and Kyle Smith in a span of two minutes gave Rancocas the lead at 3-0 midway through then first period. Clearview would chip away at the lead; first Timmy Sullivan scored a power play goal with the assist going to Shaun Stamm. Moments later those two would assist on Chris McGoldrick’s goal to cut the lead to 3-2 after two periods. Andrew Michael scored the only goal of the game and Adam Wingate stopped all 18 shots as Clearview defeated Cherry Hill East 1-0 in the double elimination tournament at Hollydell on Friday night. After a scoreless first period, Michael put home a rebound of a shot by Tim Sullivan and that would turn out to be the only goal of the game. East did not generate many scoring opportunities but when they did Wingate was there to close the door. Tim Larkin and Justin Osterdahl scored two goals each as Williamstown defeated Clearview 6-3 on Friday night at Hollydell. Larkin and Osterdahl scored power play goals in the opening period sandwiched around an even strength goal by Jim Roescher to open up a 3-0 lead. After Osterdahl's second goal early in the second period Williamstown led 4-0, and seemingly in control. Clearview had two golden opportunities to climb back into the contest with consecutive two-man advantages, but could not capitalize on either chance, as their power play went powerless. Chris McGoldrick scored three times and Shaun Stamm and Matt Klanchar added two goals as Clearview defeated Rancocas Valley 9-3 in Tier 1 action at Hollydell. McGoldrick put Clearview ahead just over two minutes into the game but Rancocas tied the game as Kurt Sporer scored with the assist going to Eric Bitzer. Clearview would score the next four goals to take control, including the first goal of the season for sophomore defenseman Tim Sullivan. Leading 5-1, Rancocas got a goal from Joe Fleming to cut the lead to 5-2, but goals by McGoldrick and Stamm, one on the power play and one short-handed put Clearview ahead 7-2. A late goal by Kevin Lion made it 7-3 heading into the third period, but goals by McGoldrick and Stamm sealed the win. Colin Davis had a hat trick and David Moore and Christian Biscardi added two goals each as Washington Township defeated Clearview 10-2 in front of a packed house at Hollydell. Joe Tropiano and Andrew Michael scored the Clearview goals. Township scored the last six goals to break open a close game. Biscardi got Township going scoring at the eight minute mark of the opening period. Tropiano tied the game on the power play, but Biscardi responded scoring a power play. Goals by Cameron Rowand and Christian Fleagle gave Township a 4-1 lead after the first period. 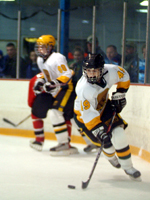 Joe Tropiano scored five goals to lead Clearview over Eastern 7-3 in Tier 1 action played at the Skate Zone in Voorhees on Monday night. 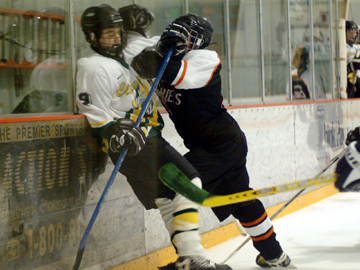 The game was only 2-1 heading into the third period, but Clearview blew the game open scoring five goals. Derrick Schemmel scored the only goal of the opening period to give Eastern a 1-0 lead, but Tropiano scored twice in the second period, once on a breakaway and one short-handed to put Cherokee up 2-1. Cherokee scored two goals in the first three minutes of the third period, with Sean Stamm converting on the power play to 4-1. Dan Drazen would bring his team back as he scored two goals in a matter of seconds, both on the power play to cut the lead to 4-3. But Tropiano scored the last three goals of the game, again short-handed, and his last one into an empty net as Clearview skated off with a 7-3 win. Washington Township and Clearview skated to a 4-4 tie in Tier 1 action played at Hollydell on Friday night. In years past this has been a huge rivalry game but in the last few seasons the intensity seem to be missing, but not tonight as Clearview came in as a heavy underdog, still looking for their first win and Township on top of the standings and undefeated. There seemed to be more Clearview fans in attendance and they made their presence known. The teams traded goals in the first period, with Christian Fleagle scoring a power play goal for Township and Ken Rodgers scoring for Clearview late in the period. Dan Drazen took care of the scoring and Mike Dougherty withstood a 21 shot third period as Eastern defeated Clearview 5-3 at Hollydell Arena on Friday night. Drazen scored three goals and assisted on another in scoring his second consecutive hat trick, having tallied three in the win on Monday night. Andrew Michael led the Clearview attack with two goals. Drazen scored the only goal of the first period, on the power play in the opening minute as the Vikings jumped out early. Dougherty made several big saves to keep Clearview scoreless. Drazen again scored an early goal, this time on a steal of a clearing pass and his quick blast, made it 2-0. Justin Osterdahl had a hat trick as Williamstown opened the season with a 5-3 win over Clearview in a penalty filled game at Hollydell. Sean Stamm led Clearview with two goals. With the referees strictly enforcing the new rules, both teams had over fifteen penalties and found it difficult to get into a flow. Tim Larkin put Williamstown on the board first scoring a power play goal with Dennis Cunard getting the assist. Later in the period Osterdahl, positioned along the side of the net deflected a point shot by Josh Haynes into the net and Williamstown led 2-0 after the first period. Clearview has started out their season capitalizing on their opportunities and it shows with the success they have been through. With four of their first five game played at home, the Pioneers have won every game to start out their season. Only their second road game played, the Tartans from Highland would be their next test. Clearview would get their first scoring chance redirected away and proved to be a momentum builder for the home team. Two quick goals by Highland proved to be enough for their defense to hold the Pioneers to a single goal. Clearview would rally, but the Tartans would survive and post a 2-1 victory. Seven penalties, seven goals and eight assists all during the third period alone highlighted the ice hockey game played at Hollydell Ice Arena Friday night. Six of those goals that were scored during that period were short handed according to the scorer's sheet. Both Rancocas Valley and Clearview were trying to extend their season as they participated in this single elimination game. These two teams were bounced out of the winner's bracket with a loss and had to battle it out on the ice looking to advance their way toward the finals. A five goal explosion by Clearview would be the difference in this game. Goalie Chuck Storms would save 26 of 29 shot attempts helping Clearview to their 7-3 victory. With the month of January coming to an end, it serves as a constant reminder that the February cutoff date for teams to have a five hundred record or better in near to qualify for the upcoming state tournament. Two teams from two different groups but having similar goals competed in a Tri-County Conference Royal Division game. The Spartans from Deptford traveled to Clearview in search of picking up a division win, but more importantly stay or move closer to the requirement to qualify for the tournament. Deptford would start with game with a lead and maintain it through four quarters. The Spartans' 73-56 victory would move them one step closer to extending their season into the playoffs. Christopher Powers' goal late in the third period snapped a 6-6 tie and gave Cherry Hill East a 7-6 victory over Clearview in a see-saw affair played at Hollydell on Friday night. Gary Tagland led East in scoring with two goals and Kyle Poderis had a hat trick for Clearview. Clearview out-played East in the first period, as goals by Mike Sullivan, Pat Coghlan and two by Poderis were sandwiched around goals by Tagland and Andrew Roth, and Clearview headed into the second period, seemingly in control with a 4-2 lead. Fresh from their win earlier in the week, the Lady Quakers were back on the field this time in the finals looking to defend their South Jersey Group III title. Clearview would be their next opponent trying to take the title away from the Quakers. On this very windy day where Moorestown had the advantage during the first half, Clearview's valiant effort during the second half would come up short. The seventh seeded Lady Pioneers would cut their deficit in half, but Moorestown would hold off Clearview's late run and claim the crown. Dan Drazen scored his first two goals of the season and Torin Lawson had three assists as the Eastern Vikings won their first game of the season defeating Clearview 3-0 in SJHSIHL action played at Hollydell. Most coaches will tell you that scoring first is important and tonight this was the first game all season the Vikings scored first as Drazen found the net on a 2-on-1 with Lawson less than two minutes into the game. Later in the period Drazen slid the puck from behind the net to Derrick Schemmel all alone in front and his quick shot beat Clearview goalie Adam Wingate for a 2-0 lead. Two teams that were right in the middle of the standings making a push towards the playoffs were the Lady Pioneers from Clearview and the visiting Lady Rams from Gloucester Catholic. Clearview had won the first meeting between these two teams representing the Tri-County League Royal Division and needed to repeat their performance in order to pick up the all important win. Clearview would hold a brief one run lead heading into the middle innings only to see Gloucester Catholic rally during the third and fourth innings. Those runs were just enough for Brittany Carosina to pick up the win by defeating Clearview by an 8-6 margin. South Jersey Sports Online would like to send our congratulations to the 8 new members of the South Jersey Soccer Hall of Fame. The South Jersey Soccer Hall of Fame now has a total of 138 members. The first class to be inducted was back in 1988. A member can be an Official, Player, Coach or Contributor. This year’s class consisted of one contributor, four players, and three coaches. Both Clearview and Highland were successful making the playoff last year and it would be safe to say that they wanted to get back there again this season. Yes it’s early, but it looks as if they both will finish the season with a record good enough to qualify. Both of these teams have the pitching and the defense to move far up the Tri-County Conference Royal Division. Clearview had won its first two games but would not win that next game as the Tartans’ bats came alive during the third and fourth innings. Starting pitcher Ryan Buchter watched three of his teammates Paul Painter, Dan Grandrino and Pat Faulls knock in three runs each to earn him the win and a 13-3 victory. After cruising past Oakcrest in the opening round of their tournament run, the fourth seeded Hornets from Pemberton hosted the fifth seeded Pioneers from Clearview at home. Playing on back to back days didn’t slow down Pemberton’s quest to advance to the semifinals. The Hornets established the momentum very quickly and held on during the second half. The scoring did pick up during the third and fourth quarters but the Pemberton would stay one step ahead of Clearveiw. With their 77-72 victory, the Hornets will now travel to Camden to take on the Panthers. Derrick Schemmel scored both goals and Ryan Doner stopped 27 shots as Eastern defeated Clearview 2-1 at the Igloo in Mt. Laurel. With the win Eastern advances into the next round and will play Williamstown on Friday night at the Skate Zone in Voorhees, for Clearview their season is over. Eastern is trying to become the first three-peat team in league history and will need more efforts like tonight’s game should they want to advance. Eastern got on the board first as Richard Smith fed a pass from behind the net to Schemmel who was camped in front and his quick shot beat Bobby Kovarovic with just under two minutes remaining in the opening period. Chris Riggs had a hat trick and Shaun Stamm added two goals as Clearview rallied from a 2-0 deficit and went on to defeat Williamstown 6-4 in first round playoff action for both teams. Clearview will now face Cherokee on Wednesday night at the Skate Zone in Voorhees and Williamstown will move into the loser bracket. Williamstown led 2-0 after the first period on goals by Justin Osterdahl and Tom Ruiz and excellent goaltending by Joshua Haines as he stopped all 18 shots. The second period Clearview continued the pressure and scored three goals in less than two minutes to take a 3-2 lead. Clearview scored three goals in a span of two minutes to break open a close game and went on to defeat West Deptford 7-2 in the last regular season game for both teams. Clearview will meet Williamstown and West Deptford will open with Eastern. Mike Sullivan and Shaun Stamm each tallied twice to lead the Clearview attack. Cory Jackmuff put West Deptford up 1-0 as Clearview started out slowly. Sullivan tied the score at 1-1 as he scored short-handed using the defenseman as a screen. You have heard it before, every win counts when trying to qualify for the post season playoffs. The Lady Tartans from Highland was one of those teams that started out the season with a few winning and losing streaks. For the second time this season, Clearview and Highland would participate in a Tri-County Conference Royal Division match-up. This time on their home court, Highland was looking for their second win in a row and they would convincingly pick up the victory. With their 39-23 victory, Highland improved their record to 7-7 which included a 6-4 record in their division. Tom Ruiz had a hat trick and Justin Osterdahl added two goals and two assists to lead the Williamstown Braves to a 7-3 victory over Clearview in high school ice hockey action at Hollydell. Since losing to Moorestown back in November 5-2, the Braves are now unbeaten in their last six games going 4-0-2 and with this surge have solidified there hold on the last playoff spot. After a scoreless first period Williamstown took a 1-0 lead as Ruiz scored a power play goal by putting home a rebound of a point shot by Eric Finn. Just twenty five seconds later, Osterdahl made a great pass from behind the net hitting Andrew Lima on the short side and a wide open net to put the Braves up 2-0. Washington Township scored twice in the third period to snap a 5-5 tie and defeat Clearview 7-5 before a packed house at Hollydell. In a game that was tight throughout, where neither team could get an edge or any kind of momentum, Townships’ depth was a huge factor in this win. Clearview seemed to have the edge in fans in the stands, and Chris Riggs gave them something to cheer about early, as he scored in the opening thirty seconds. Township responded on the power play as Dave Smetaniuk scored with Fred Brewer and Mike Rohach assisting. Chris Riggs scored seven goals as Clearview defeated Timber Creek 11-3 at Hollydell on Friday night. In just his second game back, Riggs looked like his old self, dominant on almost every shift and creating scoring chances for himself and his teammates. Timber Creek actually led 1-0 as Danny Cavallaro scored in the firs three minutes of the game. Clearview took over form there as Sean Stamm set-up Riggs twice over the next five minutes, once on the power play, to put Clearview ahead 2-1. Goals by Matt Klancer, short-handed, and Steve Short, on the power play put Clearview ahead 4-1 and in control heading into the second period. Rich Ferro scored a power play goal late in the third period to snap a 3-3 tie and propel Paul VI to a 5-3 win over Clearview. Bret Balco led the way with three goals and Clearview welcomed back Chris Riggs as he added a goal and an assist. After a scoreless opening period where the teams combined for seven penalties, Balco broke through for Paul VI at the four minute mark for a brief 1-0 lead. Seconds later Riggs tied the game on a pass from Jim Fritz. Clearview took the lead with Mike Sulllivan scoring on the power play. Zack Booth tied the score at 2-2 on a nice feed from Ferro. Mike Weaver set-up both goals as Moorestown edged Clearview 2-1 and took over sole possession of first place in the SJHSIHL. Playing on the road, Moorestown continued its strong play this season, skating three lines and playing solid, stay at home defense. The first period was played tight and featured only two penalties and not many quality scoring chances. That is until the final thirty seconds when Weaver knocked the defenseman off the puck in the corner and fed Kevin Schaffer at the point, he found Bodine in the slot and his shot beat Bobby Kovaroic for a 1-0 lead. After Dan Greene scored a power play goal for a 2-0 lead five minutes into the second period, Moorestown seemed to be in control, but things were just about to heat up. Holy Cross was looking for its first win of the season, but Clearview had too much firepower as they defeated the Lancers 7-0 in action at Voorhees on Monday night. Seven different players scored for Clearview and Holy Cross could only manage 9 shots for the game, and just one in the final period. After Mike Sullivan and Andrew Michaels gave Clearview a 2-0 lead after one period, a four goal second period put the game out of reach. After Steve Short's laser-like blast just over the blue line caught the long side and put Clearview up 3-0 in the first minute of the second period, Clearview continued to put the pressure on Holy Cross. Jim Fritz scored his second goal of the game with less than three minutes left in the third period as Clearview defeated Eastern 5-4 in SJHSIHL action played at Hollydell. The game was a seesaw affair with each team taking leads, but neither team taking control of the game. After a scoreless first period, Clearview took a 1-0 lead as Mike Sullivan scored a power play goal from the circle. Midway through the period with Eastern on the power play, Sullivan stole the puck and scored on a breakaway to make it 2-0. Eastern responded seconds later on the same man advantage, Dan Tavana put home a rebound of a Nick Rubino shot to cut the lead to 2-1. They are that front line that sometimes goes un-noticed when a game is going well. Quarterbacks have all the time in the world to survey the field for an open receiver and runningbacks have the luxury of picking and choosing quickly which gap to run through. That was quite evident for Clearview's football team Friday night on their home field. Four rushing touchdowns and two passing proved that the o-line did its job in a very important win to guarantee a five hundred percentage run in hopes of being selected for the postseason. Clearview defeated Woodstown by a 45-13 margin and picked up their second win in a row. Shaun Stamm scored three goals and Mike Sullivan added two goals as Clearview defeated Cherry Hill West 7-1 in high school ice hockey action played at Hollydell. Leading just by 2-1 heading into the third period, Clearview erupted for five goals to pull away from an under-manned Cherry Hill West team. Skating with only ten players, West kept the game close as goaltender Andrew Silcox only allowed goals by Stamm and Mike Wolk in the first two periods while turning aside 22 shots. Cybulski scored the only goal for West on the power play early in the second period. Steven Short had a natural hat trick as Clearview defeated Cherry Hill East 6-3 in high school ice hockey action played at Hollydell. Short scored the first three goals of the game, all in the first period, as Clearview took control early and never looked back. After scoring early in the period to put his team up 1-0, Short stole the puck with Cherry Hill on the power play and netted a short-handed breakaway midway through the first period to make it 2-0. Senior goaltender Bobby Kovarovic had an impressive game as he kept East off the scoreboard while Clearview built its lead. Kovarovic stopped breakaways by Woods, Stomel and Woods again early in the second period. When the whistle is blown indicating the start of the game, all of the pre-game preparations by the coaching staff finally would get executed on the field. Highland knew they would have a tough time against one of the leagues' leading scorers in Kim Brozosky. Trying to keep up with her throughout the entire game wouldn't be easy and it wasn't. The senior from Clearview Regional dominated her position during both halves of this Tri-County Conference Royal Division field hockey game. Brozosky added four more goals to her 17 season total helping the Lady Pioneers pick up the 5-0 victory at Highland.